As students at UW-Madison, we quickly become used to walking far and frequently all over campus. With all this walking, we’re going to need more than just $4 Old Navy rubber flip-flops. I learned very quickly that my trusty pair of Birkenstocks were the most indispensable item I had at college with me! Because walking is such an integral part of our everyday life, we should make it a point to take care of our feet! 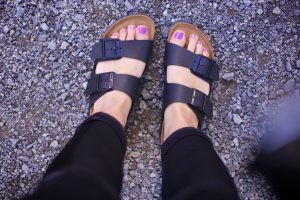 Birkenstocks provide great arch support, which is good not only for preserving a healthy foot shape but also for maintaining good posture and preventing back pain. Beyond the chiropractic and orthopedic benefits Birkenstocks provide, they’re also practical. They’re casual enough to slip on with leggings and a sweatshirt, but are also nice enough that they can be paired with a cute summer outfit or dress! They are also unisex, meaning anyone can feel comfortable wearing them. If you’re concerned about the price (on average, $100 a pair) I urge you to consider the immense value you’re getting out of it. I got my first pair 3 years ago, right before I came to campus as a freshman; I’ve been wearing them almost every day for the last 3 summers and they’re still in good shape! Whether you’re walking out to the hospital, to Engineering, or even just down State Street for BOGO Starbucks, a trusty shoe is always important. If you’re looking into investing in a god pair of shoes before coming to Madison, consider Birkenstocks!